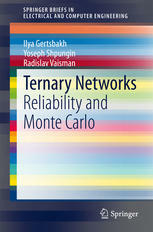 The authors of this book (at least the first two authors) have produced quite a substantial work already in the area of network reliability and Monte Carlo approach for reliability assessment as is evident from the publication [1-4] cited below which were documented in the International Journal of Performability Engineering. The present book therefore is a sequel to the research they have carried out further in this direction. The present booklet extends the work done earlier and extends their work to systems comprising three state components instead of conventional two state components which are usually a good (working) and a bad (failed). Such components are quite common in electronic and communication systems. In case of communication system a failed state is one in which the connectivity of communication is lost. The authors have successfully demonstrated the use Monte Carlo simulation and the D-spectra technique for computing reliability of systems in . D-spectra technique works well with systems having statistically independent identical components in the range of 30-100. The third state is assumed to be a state between the good and bad state. The easiest way to imagine of third state is through capacity related flow network. In such a flow network, the states can be full capacity flow (success) and zero flow (failure) and the third state (intermediate state) could be a state allowing partial flow rate. There are several examples of systems where such a situation can be conceived of. D-spectra technique can be extended to multi-state networks with binary components . The book therefore provides a practical approach to handle such systems economically. The book also considers a situation where two or more finite system may have interaction. In short the booklet can be very useful source for computing reliability of small or medium sized systems for any planner or designer of systems who intends to consider reliability as one of the parameters of design. Useful information contained in it is suitable as a reference book for practicing engineers.
. Ilya Gertsbakh and Yoseph Shpungin. Models of Network Reliability: Analysis, Combinatorics and Monte Carlo. CRC Press, U.S.A.2010. (Its review was published in IJPE , May 2011;7(3):262).
. Ilya Gertsbakh and Yoseph Shpungin. Network Reliability and Resilience. Springer Verlag, Hedelberg,2011. (Its review was published in IJPE , May 2012; 8(3):299).
. Ilya B. Gertsbakh and Yoseph Shpungin. Signatures and D-spectra and Their Use in Reliability Calculations: A Review. International Journal of Performability Engineering, July 2012; 8(4):367-378.
. Ilya Gertsbakh, Yoseph Shpungin, R. Vaisman. Network Reliability Monte Carlo With Nodes Subject to Failure. International Journal of Performability Engineering, March 2014; 10(2):163-172.